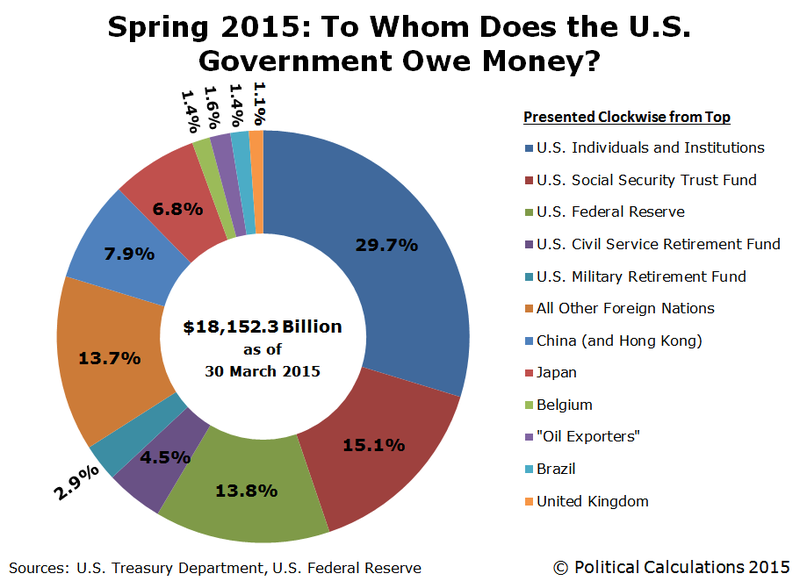 Spring 2015: To Whom Does the U.S. Government Owe Money? The big news is that debt held by “Mainland China” has once again edged out the total U.S. government-issued debt holdings of Japan to reclaim its undisputed spot as the biggest foreign owner of the U.S. national debt. That China is the largest foreign holder of that debt was never really in dispute, however, because the figure for Mainland China omits the amount of U.S. debt held by Hong Kong, which has been under Chinese rule since 1997. Collectively, foreign entities hold about 47 percent of all the U.S. government’s “Debt Held by the Public”, which totaled $13.099 trillion on 30 March 2015. Domestically, the big story about the U.S. national debt is that it has been essentially frozen at $18.152 trillion since 13 March 2015, which is when the total public debt outstanding of the U.S. government hit its statutory debt ceiling. Since that time, the U.S. Treasury has been playing something of a shell game to hold the U.S. national debt at that level, replacing the holdings of debt held by entities it controls with I.O.U.s as it continues issuing new debt to other holders. In our chart above, that shell game shows up as a decrease in the amount of debt that appears to be held by the U.S. Civil Service Retirement and Disability Fund, which appears to have fallen from $857.2 billion, the amount it was reported as holding at the end of the U.S. government’s 2014 fiscal year, to $818.2 billion just six months later. What that change means is that in just the first 14 days after the U.S. national debt hit its statutory ceiling, the U.S. Treasury exchanged at least $39 billion of short-term debt that came due in the holdings within the U.S. Civil Service Retirement Trust Fund with I.O.U.s so it could continue issuing new public debt to other parties. 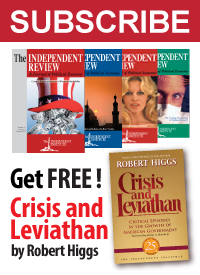 That situation will change suddenly and dramatically when the U.S. Congress acts to increase the nation’s statutory debt ceiling, which will likely happen as it progresses toward passing a budget for the first time since 2009. When that happens, the U.S. Treasury will rush to exchange the I.O.U.s that it has issued into the accounts it controls with newly issued U.S. government debt securities. When that happens, it will be as if the U.S. national debt had never been frozen at 18.2 trillion dollars. Federal Reserve Statistical Release. H.4.1. Factors Affecting Reserve Balances. Release Date: 2 April 2015. [Online Document]. Accessed 15 May 2015. U.S. Treasury. Major Foreign Holders of Treasury Securities. Accessed 15 May 2015. U.S. Treasury. Monthly Treasury Statement of Receipts and Outlays of the United States Government for Fiscal Year 2015 Through March 30, 2015. [PDF Document]. Cross posted at Political Calculations.